Buy online BLE-100 V4.1 Bluetooth Module in India at low price from DNA Technology, Nashik. 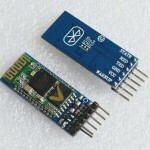 BLE100 is an ultra-low power Bluetooth V4.1 Moduke (Advance Bluetooth version of V4.0). It is used for point-to-point data transparent transmission. User device can communicate immediately after simple setup without concerning about transport protocol. The module supports master and slave mode. User not only can use both master and salve for transparent transmission, also can develop APP on the basis of standard BLE protocol. The module supports one-to-many broadcast, and has built-in iBeacon protocol. User can make it an iBeacon equipment with simple setup.